Fixed wrap. Body 55% linen 45% cotton, Bodice lining 100% cotton. Concealed back zip. Bodice fully lined. Lovely green floral Boden trousers size 14 Waist 34” inside leg 28” Cotton with a little elastin side and back pockets Never worn! So have to go! Ladies Denim Look Boden Dress. Size 14. In excellent condition, only worn twice. Length 37 inches. 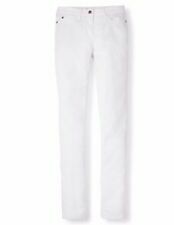 Ladies Boden Wide Leg Trousers . The trousers are used and in good condition. We always list with a low starting price. Usual shirt style. Two button down pockets to top, side pockets to skirt. Fastens with studs all the way down the front. Long sleeves with cuffs. We try to describe everything honestly and we don’t list anything in a condition that we wouldn’t be happy to receive ourselves. Lovely linen blend beige and cream skirt. Boden. Size 10. Has pockets on front- so comfy and flattering. Zip up fastening on side. Knee length on me (5”4). Great condition! Boden denim Shirt dress size 12. It’s a 12L and is 39” from the neck to longest part of the hem. The dress is slightly shorter at the sides than at the front and back. It has really lovely pintuck detail around the shoulders (I can’t resist a pintuck!) but is now sadly too small for me. The dress is used but really good quality and still in good condition. Dispatched with Royal Mail 2nd class. Boden 18r cropped trousers Condition is new they have not even been tried on. They are really nice work trousers. Boden ladies denim dress size 12. It’s a great stretchy light material - perfect for summer. Condition is Used. Dispatched with Royal Mail 2nd Class. Boden Grey Tunic size 12. Condition is Used. Dispatched with Royal Mail 2nd Class. 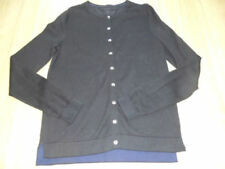 LADIES BODEN BLACK JUMPER SIZE XL. Only worn once Sleeves about elbow length Ideal as beach cover-up or over a vest top on cooler evenings Condition is Excellent Non smoking household Dispatched with Royal Mail 2nd Class. Boden Dress. Blue (a muted shade of navy). Thick jersey type material gives this dress great structure. Length (shoulder to hem): 102cm / 40" (approx.). 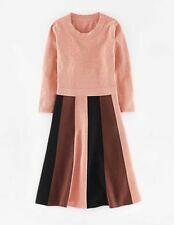 J ade coral dress. length 43”. 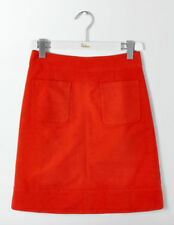 f lared skirt. w aist 14.5”. pit to pit 1 7. 5”. Boden red vest top size 8 in good condition. Colour better in first pic. BODEN - UK 10. LADIES SHORT SLEEVE BUTTON UP LIGHTWEIGHT CROPPED CARDIGAN TOP. CORAL AND WHITE STRIPED. MATERIAL: 55% LINEN AND 45% COTTON. Boden Tie Front Cardigan - Black. Condition is Used. Dispatched with Royal Mail 2nd Class. Size 18 tie at front. Back of neck to hem 20inch. Under arm to under arm 24inch stretchy. Boden Ladies Breton Stripe Blue & White Blackberry Jersey Dress Size 8R. Condition is Used. Dispatched with Royal Mail 2nd Class. boden dress 12. Condition is Used. Dispatched with Royal Mail 1st Class. It has lovely red cotton outlining and is a jeans style. Boden mid length ladies dress. Black, size 10. Condition is Used. The colours of these hoodies is more faded look than it appears on the photos. Fine knit cotton 79%, nylon 18%, elastane 3%. In Blue Polka Dot Design,Drapery around waist and back,Fully lined in 100% cotton. Machine washable. Boden Black Short Sleeve Ponte Pencil Dress Size 12. Condition is Used. Dispatched with Royal Mail 1st Class. QUALITY DRESS FROM BODEN. STRETCH DENIM DRESS. ALL BUTTONS ARE USED TO CLOSE THE DRESS. LIGHT BROWN. SIZE 10 LONG. SO YOU CAN HAVE AS MANY OPEN AS IS REQUIRED. boden denim shirt dress size 12 R. Condition is Used. Dispatched with Royal Mail 1st Class. BODEN ladies denim shirt size 12. Condition is Used. Dispatched with Royal Mail 1st Class. Fab navy blue and white print empire line dress from BODEN. Boden Denim Blue Tunic Shirt Dress Size 14L. Condition is Used. Dispatched with Royal Mail 1st Class. Two Pairs Boden 10R Chinos. One pair is beige in colour with a side stripe down each leg. The other pair are grey. These have a slight mark I’d never noticed before on the back right leg (see photos). Both pairs are slim leg, not skinny, and taper to the ankle. Can be worn straight or turned up at the hem. They are in good used condition, slightly faded but this is kind of the style with chinos. Dispatched with Royal Mail 2nd Class. Smoke and pet free home. BODEN LADIES GORGEOUS Indigo slim flared Bootcut jeans UK size 10L. BODEN LADIES GORGEOUS Indigo slim flared Bootcut jeans UK size 10L. Condition is Used although in great condition. Dispatched with Royal Mail 2nd Class. Really comfortable brown velvety moleskin trousers with slight stretch (2% elastine) Straight leg. Size 12 Regular. Worn but still in great condition. 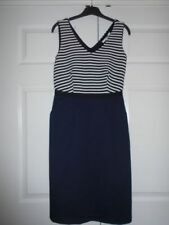 NWT Boden Corinne denim dress in size 14 L. Perfect for wear as is or with a Breton tee underneath. Chest 38 " length 40". Cotton with stretch. Please see my other listings this week for more Boden dresses, I am happy to combine p&p.